This is a byproduct of MidiALF/CV project: I was testing the fab’s ability to handle plated slots and ended up with what looks like a pretty useful tool to convert 1/4″ cables to 3.5mm and back. Instead of maintaining a bunch of mixed jack conversion cables it’s now possible to just run regular ones through this tool. IMPORTANT: 1/4″ jacks MUST be soldered on the silkscreen side! To order Jack-o-mix PCB, please send an email to pete at kvitek c o m specifying how many PCBs you need and a country where to ship them, and I’ll send you a PayPal invoice. Shipping to the US is $5, Canada $7, elsewhere $15. 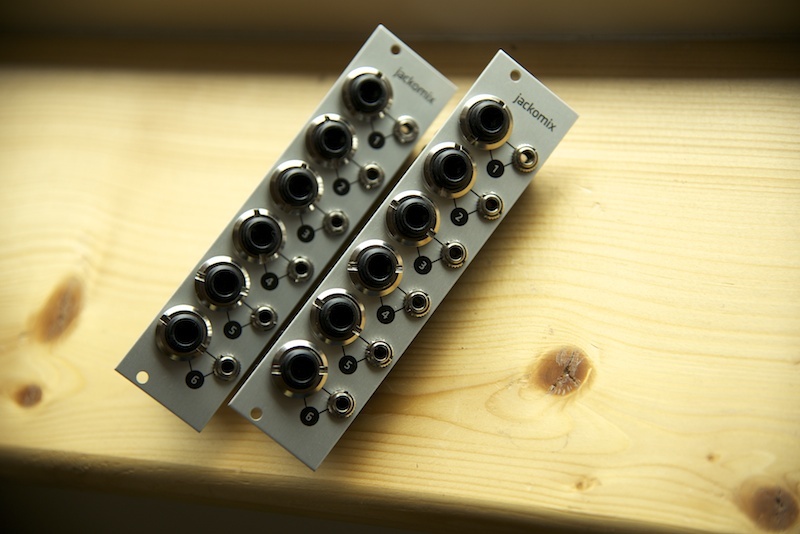 Eurorack panels by Grayscale are available here. Jackomix Euro panel drawing. COUNT 1 FOR NEXT SET 2 SEND WHEN I ORDER THE CV EXTENSION, PLEAZE. I would be interested in one with my CV extension. Thank you. Yes, two Jack-o-mix boards to go with the CV extension please. please count me in for 2 boards! thanks! I’ll take one, and if its all the same to you I will get it at the same time as a CV board. Thanks! We had contact via email, my order is on-hold awaiting CV board. If possible I’d like to add 4 of these. Question: why not have 8 socket pairs? 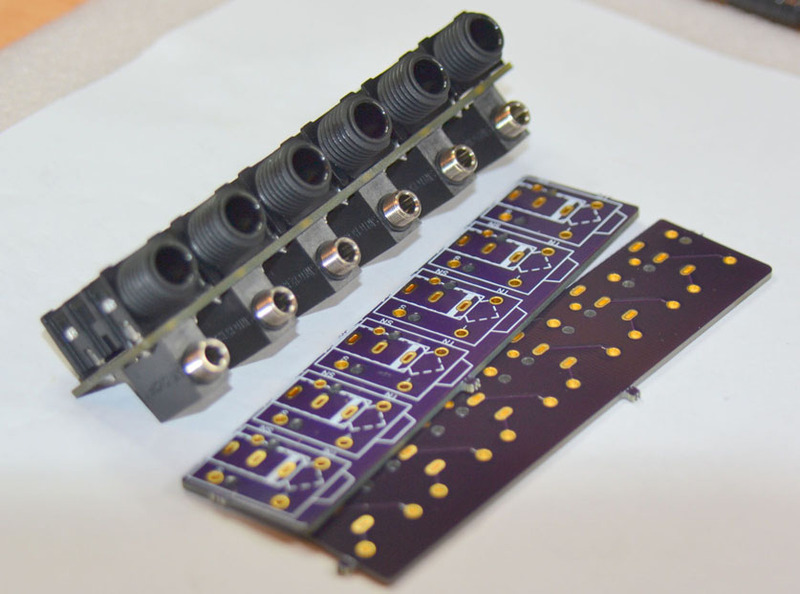 8 socket pairs will make it too long to fit into Eurorack format. Sorry for my silliness but I still can not wrap my head around and visualize how this can be used with CV extension or is it supposed to be just used in a eurorack case ? If you have mixed modular environment: Euro and MOTM, or just want to interface Anushri to MOTM, you have to keep around a bunch of 3.5mm to 1/4″ cables. With Jack-o-mix you can just use regular 3.5mm and 1/4″ cables you already have and connect them through Jack-o-mix. Can you make the same for rack, but with 1/4 on rear panel? Sorry, no, i’m not doing custom projects. Eagle files are published, so you can DIY. Great tool, does it exist with MU/5U panel? Nope. GrayScale has a Eur panel.